Last week, I posted about my experience at the Wreck-It Ralph Press Day on my trip last month to Los Angeles. Today, I’m sharing with you my very first voiceover! It’s funny because I was sooooo nervous about it, but it ended up being one of my favourite parts of the trip. I’m normally a very shy person until you get to know me and extremely uncomfortable with any kind of public speaking. The bloggers were split into groups of three and my group’s first stop was the Voice Demonstration inside a real recording booth. Coaching the bloggers was Storyboard artist/voice of Gene/voice of Zombie Raymond Persi and recording booth technician Gabe Guy. 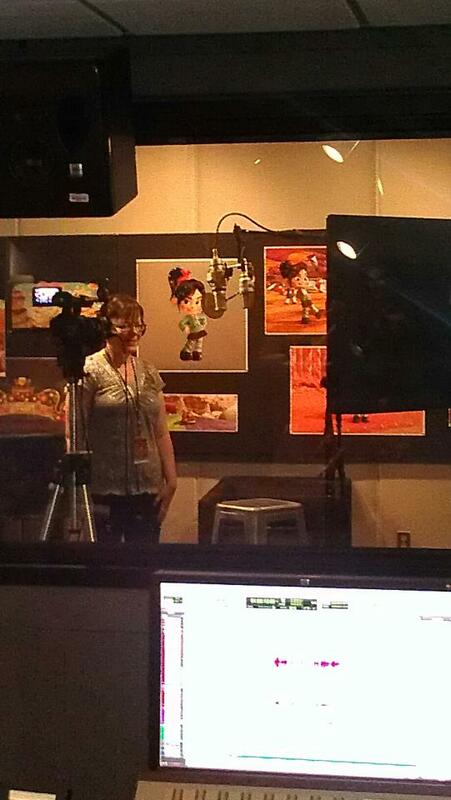 This was THE booth that the stars of Wreck-It Ralph, Sarah Silverman and John C. Reilly, used! I thought maybe we would watch a voice demonstration and see how it was done. To my surprise, I learned that we were going to be reading the lines as one of the characters! I was shaking because I was so nervous! I took a few deep breaths and made my way into the recording booth. I would play the part of Venelope and had a few lines I had to read. They showed up on the TV screen in front of me and I just had to read them when it was my turn to speak. It actually turned out to be pretty easy. Plus it was fun! I surprised myself and really got into the part. Here I am as the voice of Venelope. My daughter didn’t believe me when I told her that was me as Venelope! This will be an experience I will never ever forget. Thats awesome! Looks like so much fun! That is such a treat to be able to do a Disney voice, looks like you had so much fun…and you sounded great by the way. If you ever give up blogging you just may have a future in doing voices for the movies!! Sounds like you had fun. Thanks for sharing your experience with us! Honestly, I am so jealous- I’d love to have that video of myself to share with my girls. What an awesome opportunity! How fun! I AM SO GLAD YOU DID NOT LET YOUR NERVOUSNESS GET THE BETTER OF YOU. THIS IS FANTASTIC. WHAT A WONDERFUL OPPOURTUNITY!!!! YOU DID SOOOOO WELL. WOW WHAT A BUNCH OF LUCKY LADIES. I BET YOUR FAMILY IS SO SURPRIZED. MAYBE YOU SHOULD CONSIDER ADDING THIS AS ANOTHER JOB . Wow!! So very cool!! Did you ever think that you’d be doing something like that?? I hope you keep these clips and stuff because you’ll want to have them to look back on. You get to do some pretty amazing things and I’m so very envious! This looks like fun. thanls for telling about this great experience. I think what you did is absolutely outstanding!! How cool for you to do what so many of us dream of being able to do 🙂 I am proud that you did not let fear and nervousness step in and take over. Way to rock it! Keep up the great blogging…you have become an inspiration for my daughter. Oh, that is so cool! I bet your daughter got a kick out of it! That is soo cool that you got to experience that and did a great job! How cool is that! What a super neat memory to have! Wow…talk about an amazing experience!!! Sounds like a wonderful and educational time!